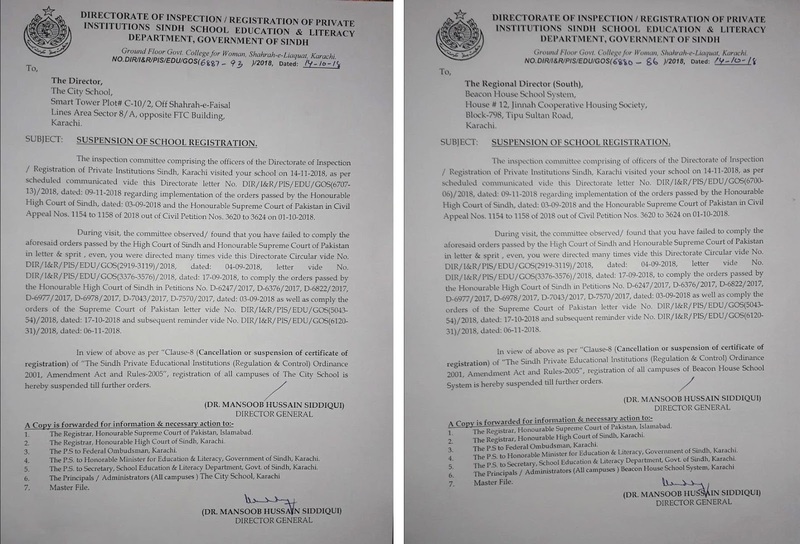 The Sindh government on Wednesday suspended 56 campuses of The City School and 65 of Beaconhouse for not following court order over the fee hike. In October, the Sindh High Court banished tuition based schools from hiking fees by in excess of 5 percent and requested them to acknowledge duty according to the old fee structure. The bench likewise issued a notification to the government to apply income tax on school fees. The court had reported the choice after in excess of 100 guardians of school children moved the court against, what they named, one-sided fee hikes. The Director of Private Schools Sindh said it had consistently composed letters to both the school systems requiring the execution of the decision with respect to fee hike yet no profit. On the off chance that the court arrange is upheld inside seven days of the suspension, their registration will be reestablished and upon failure, the schools will be fixed in presence of a judicial magistrate. Director General of Directorate of Inspection of Private Schools Mansoob Hussain Siddiqui said the two schools were regularly issued suggestions to implement the best court's structure, yet all futile. He, in any case, illuminated that the suspension of the schools' registration won't influence educational activities.